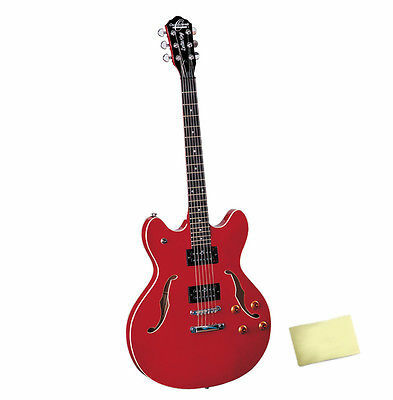 Save With This Bundle: Package Includes: Oscar Schmidt OE30CH Cherry Vintage Style Single Cutaway Guitar and a Custom Designed Polishing Cloth. Classic semi-hollowbody styling, versatile tone options, and quality construction and components add up to a truly great instrument. The OE30 is perfect for rock, jazz & blues and is an outstanding value for anyone looking for a hollow-body instrument. Keep any impurities off your equipment with this custom designed polishing cloth. Plush and non-abrasive, your instrument will stay bright and shiny like your rock star self! G&L USA ASAT CLASSIC THE NEW IMPROVED TELECASTER BY LEO FENDER EXTRAS!